Summer time in Vegas means swimming and enjoying the sunny skies to most, but for some it’s all about fighting with your hair to keep it in it’s best possible condition. The sun, heat, water (including pool chemicals) and more can damage your hair. There are ways to keep this from happening by using proper products at home and doing proper treatments at the salon. These are NY Hair Co’s favorites that we carry! 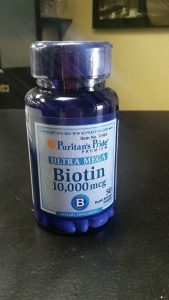 Biotin Pills: Biotin is a vitamin you can take orally to improve your hair and nail growth. It strengthens and thickens the hair and nails making it stronger. Milk Shake Incredible Milk Leave in Conditioner: This leave in conditioner offers 12 benefits to you hair: Repairs all hair types, Frizz Control, Prevents Split Ends, Heat Protection, Long Lasting Hair Styles, Detangles, Natural Shine, Adds Body and Volume, Easier Ironing, Protects Color, Protects from UV Rays, Smoothes the Cuticle. It can go on wet or dry hair after showering (or even swimming!) Instead of using spray sunscrean to protect your hair, causing it to become greasy and smelly, you can use an actual hair product to protect your hair any time you go outside! 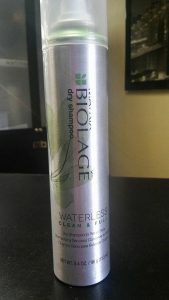 Matrix Biolage Dry Shampoo: Washing your hair every day not only dries your hair out but it also strips any artificial color, causing fading. Avoid washing more than twice a week for longer lasting color and healthier hair. To cut the greasy, dirty look you can use dry shampoo inbetween actual shampoos. This product absorbs oils and any odors that the oils may cause. It’s easy to use as well! Spray on the roots of your dry hair (focus on spots that are oily) and work in the product with your fingertips for best results. Viola! Simple and effective! Added bonus?? It creates lift and body to your roots giving your hairstyle the extra bump it may need! 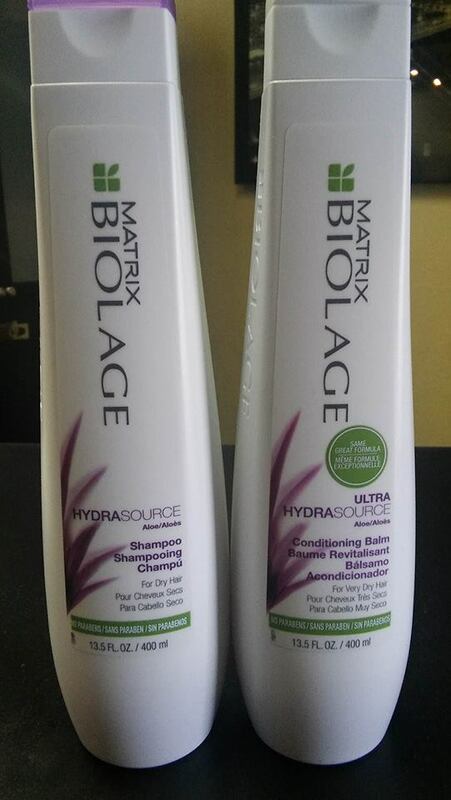 Matrix Biolage Hydrasource Shampoo and Conditioning Balm: This is the Best Seller at NY Hair Co, and for good reason! This Shampoo and Conditioner Duo Set are BOTH Paraben free and extremely hydrating without making the hair feel greasy. They are both safe for color treated hair so you can get the moisture without the fading! The conditioning balm is a great conditioner and detangler. These products are formulated with Aloe, Cupuacu Butter, and Apricot Kernel Oils to moisturize your hair for long term results instead of using Parabans to coat your hair making it appear healthier temporarily. 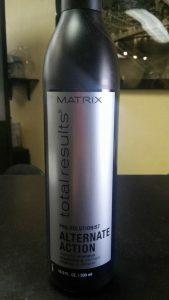 Matrix Total Results Alternate Action Clarifying Shampoo: This clarifying shampoo is our favorite for one big reason; it removes product buildup WITHOUT stripping the hair of it’s natural oils. 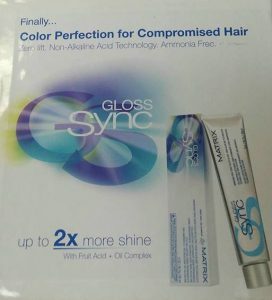 This product is perfect for swimmers, as it has a chelating agent that helps remove chlorine and other mineral deposits from the hair (added bonus for blondes, no more swimmer green hair!). Shampoo with this product for 1-2 minutes before rinsing to remove any buildup and follow with your favorite conditioner for best results! 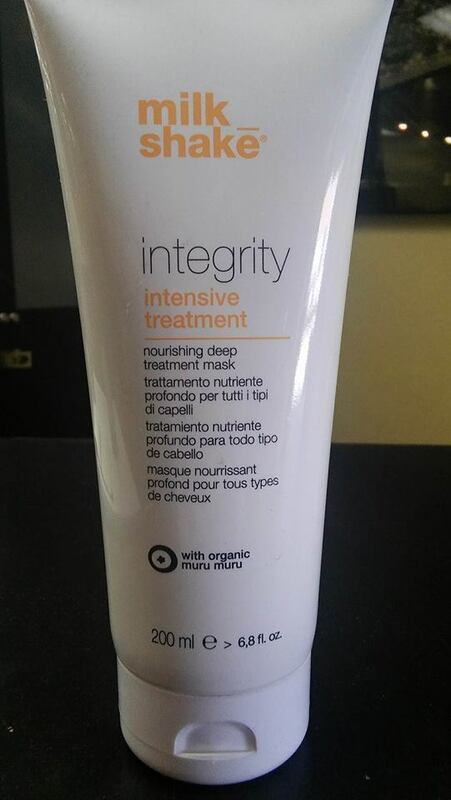 Milk Shake Integrity Intensive Treatment: This intense mask with have your hair hydrated and bouncy in no time! Using Muru Muru Butter and Coconut Oil, this mask is safe for all hair types and significantly reduces frizz, leaves hair conditioned, detangles, and the end results are soft, radiant, and healthy hair. After shampooing, work the Intensive Treatment into your hair for 3-5 minutes before rinsing for best results. Matrix Color Gloss Treatment: The Matrix Color Gloss Treatment is a zero lift, ammonia free hair treatment that adds ceramides/proteins and natural shine back the your hair while sealing the cuticle. This treatment also comes in a few color refreshers (black, browns, reds, coppers, and special toners for blondes) to add to your treatment to add pigment to your hair while improving the overall health. Normally this service at NY Hair Co starts at $45, but when done with any other service the price drops to $35. Results last from 1-3 months depending on proper home care and product use. Olaplex Treatment: Olaplex is the only product scientifically proven AND holds multiple patents proving it physically rebonds your hair internally. Think of this service like this: you shatter your wrist. You can either get surgery and have your wrist heal completely with no loss of mobility and will fully heal OR you can just get a cast, and MAYBE your wrist will have partial mobility. Wouldn’t you want the surgery?? 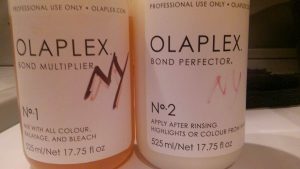 Olaplex is basically surgery for your hair! This product is silicone free (unlike its impersinators like B3, Uberliss, etc which all contail oils and different forms of silicone) so it doesn’t coat the hair for a temporary fix. It fixes the bonds (even when added to color services!) for long term effects, can be done as often as you’d like (you can’t over-do Olaplex!! ), and all it does is benefit your hair. Want to transform your haircolor? Olaplex helps us push your hair past the norm, getting you desired results with little to no damage! Each treatment costs $45, so why not fix your hair for a fraction of the price of other treatments that claim they do the same, but really don’t? This entry was posted in and tagged Biolage, color gloss, color sync, conditioner, dry shampoo, hair care, hair color, hair treatments, matrix, milkshake, olaplex, product, retail, shampoo, sumer, treatment on June 1, 2016 by admin. If you still have doubts… TRUST YOUR STYLIST!! We all went through years of training and education to get to where we are. We will tell you and show you exactly what you need for your hair! 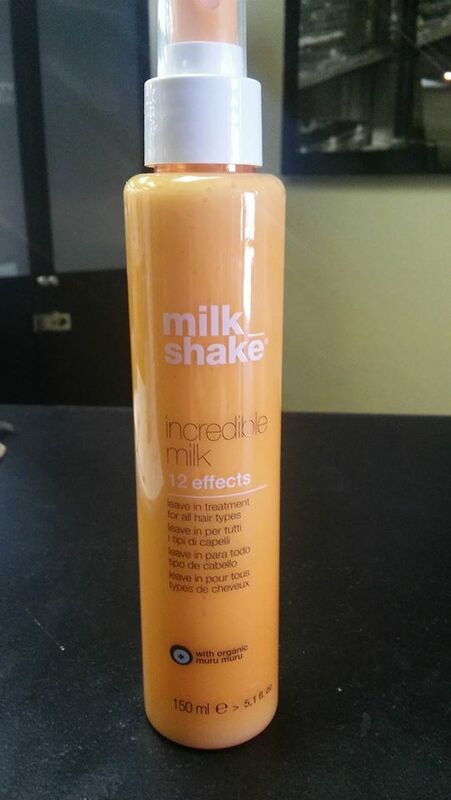 NY Hair Company has moisture AND protein treatments available and we can customize each treatment to suit your hair! If you love your hair color but hate how it fades, or love your cut until it becomes frizzy after one shampoo it’s time to take control of your hair again. Don’t let it have a mind of its own, and treat your hair to what it really needs. This entry was posted in and tagged hair, hair color, hair follicle, hair treatments, healthy hair, heat damage, keratin protein, moisturize, protein on May 13, 2016 by admin.